iStick Tria Mod is one of the powerful mod launched by Eleaf. Compact yet, the iStick Tria Mod is still powerful, supported by three 18650 cells and can fire up to 300W so that you can enjoy longer vaping hours without a letup and a huge vapor. Featuring a 0.91 inch screen displaying the three battery levels so that you can have a better control over the battery conditions. With dual circuit protection and reverse plolarity protection, both can ensure the security during the whole vaping and charging process so that you can have a great vaping experience. Coming with preheat function with upgradeable firmware, the device can heat up the coil at a high wattage. Three colors for your choice: Black, Silver and Greenery, always a suitable one for you! 1. Powered by three 18650 cells, it can fire up to 300W, providing you longer vaping hours and larger vapor production. 2. 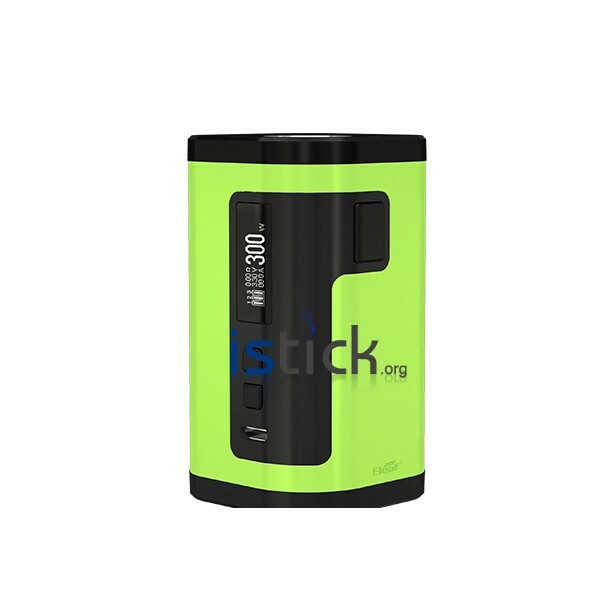 Compact size and fashionable design, simple yet exquisite, makes the iStick Tria Box speical. 3. With a 0.91 inch screen displaying the three battery levels, you can have a better control over the battery conditions of each. 4. Supporting firmware to upgrade, you can download the firmware from our official website. 5. Various vaping modes: VW/TC(Ni,Ti,SS,TCR-M1,M2,M3). 6. Supporting 2A current for quick charge. 7. Battery Balancing Trickle Charge System can bring the three battery to the same leve, ensuring the security during vaping. 8. Coming with preheat function, the device can heat up the coil at a high wattage. 9. With switchable interfaces, youc can switch the display interfaces to see what you want. 10.With high campatibility, it can handle tanks up to 25mm diameter without any overhang. 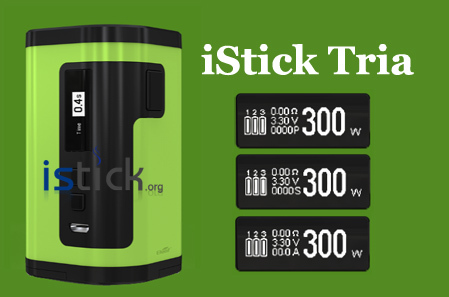 Simply charge iStick Tria Mod by connecting it with a computer, a power bank, a wall adapter or other electronic devices (with a USB port that is capable of providing a charge) via USB cable, also you can purchase an inexpensive USB car adapter, thereby affording you the ability to charge the iStick Tria in the car. This is particularly useful while on long drives and road trips.